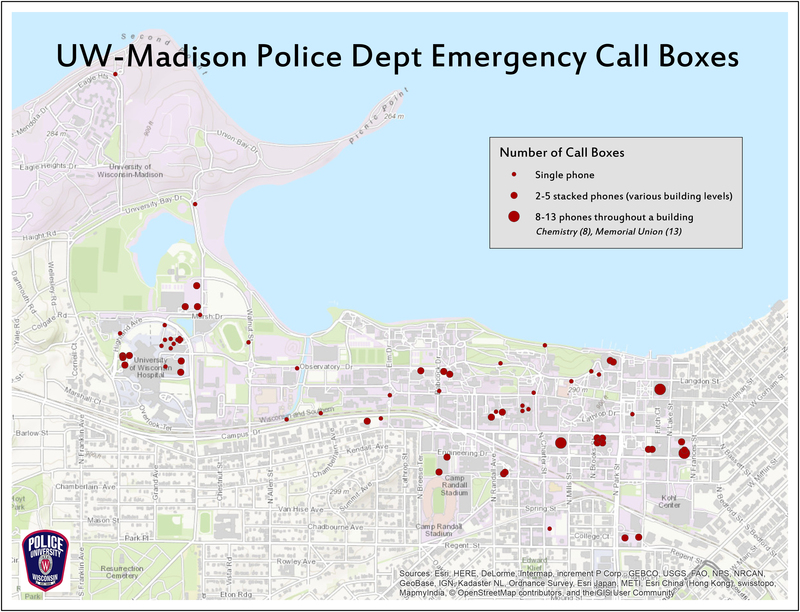 There are approximately 140 emergency phones on the UW-Madison campus, including the blue light phones (in areas like Picnic Point and the Lakeshore Path), phones in parking ramps (including elevators), and in many buildings. Below is a map of the locations of blue light emergency phones. These phones dial 911 directly with the push of a button, and the call is connected to the UW-Madison Police Department Communication Center. These phones are to be used for emergencies only. When the button is pressed, the dispatcher will receive the call, along with the location of the phone the call is coming from, and an officer will be sent to check the area whether or not you speak with the dispatcher. If you accidentally push the button, please remain on the phone to inform the dispatcher there is no emergency. All emergency phones on campus are tested once per month to ensure they are working properly. If you have additional questions regarding emergency/blue light phones on campus, please contact UW-Madison Police Department Communication Manager LeAnn Krieg at by email, or by calling (608) 265-9531.